I had the opportunity this past weekend to help out my good friend and fellow race director, JJ Johnson, at the Honolulu Triathlon. JJ runs a tight ship and I would expect nothing less from an ex-Army officer! The concept of "a laid back Hawaiian" is not a term in JJ's vocabulary. He also has something to deal with that not many of us on the mainland have to consider. 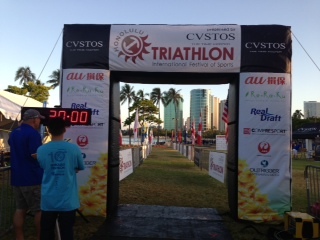 Almost two thirds of the participants who attend his race are hosted by the owner of the Honolulu Tri - Athlonia, a Japanese company, and do not speak English. That means that everything has to be in two languages and all the briefings are in both languages. JJ had an awesome Japanese interpreter, Shoko, to help with briefings, announcing and rewards but out "in the trenches" at the swim start, finish line or in transition it was a different story. For those of us working the race it meant we were frequently asked directions or questions in very rudimentary English or in Japanese, or with sign language. It could be challenging, frustrating or rewarding depending on how the questions were asked and answered. We all resorted to a lot of hand signals and sign language for directions and communications. Think about this - getting people in the correct swim waves using your fingers and sign language to display age for the age group starts, explaining where bike numbers were located in transition, how to find medical or first aid, how to get back into transition, where is lost and found, and all of the other questions that race directors and volunteers get on a regular basis. Thankfully, there were also Japanese speaking volunteers for the really hard questions. Despite the language barriers, one thing really stuck out - a triathlete is the same regardless of the language. We all come to a race with certain expectations, we have a common objective, and we have a short-hand way of talking that breaches any language barriers: where do I put my race number, where is my wrist band, how do I get body marked, where is the swim start, how do I get my timing chip, and will you please take my picture because this is my first race and I finished, and the best of all...what a cool finisher medal! A couple of years ago JJ and I formed a "sister race" relationship between our Santa Cruz Tri and the Honolulu Tri. The first year we did discounts to each others' races. This year we stepped it up and did a drawing for a free entry exchange that included air fare and two nights of hotel for one lucky triathlete. It was a great experience and I am so glad I got to experience it, that Ruthie Callahan got to do her first Honolulu Tri and that we will be hosing Kerri Scott from Honolulu at our Santa Cruz Tri in August. So stay tuned...because we are definitely going to do this again next year and JJ will be at Tri Santa Cruz to award next year's free race entry for the Honolulu Tri to one lucky Tri Santa Cruz participant.